You don’t have to wait until the summer to enjoy the best of what South Devon has to offer. The sheltered position and mild climate of the English Riviera means that the region is the perfect destination at any time of year. Spring in South Devon is particularly beautiful, when the countryside bursts into a vibrant tapestry of colour. The warmest of welcomes awaits you on the English Riviera, Torbay's beautiful South Devon coastline. 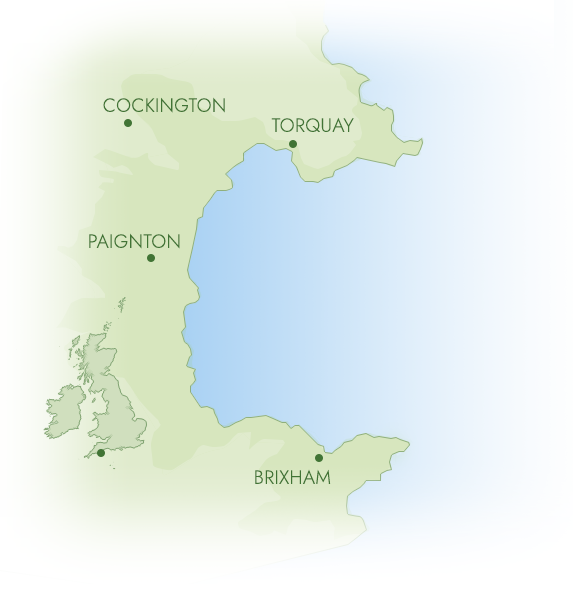 Surrounded by stunning coast and countryside, Torbay, including Torquay, Babbacombe, Cockington, Paignton and Brixham offer fantastic year round holidays with lots of things to do for everyone and with the opening of the new South Devon link road it's never been easier to get here! The English Riviera may be most famous for its award winning sandy beaches and exotic palm trees, but has much more to offer than just seaside holidays. The English Riviera has a great choice of indoor and outdoor attractions and has been designated as a UNESCO Global Geopark. Getting out on the water is what our visitors love to do, and there is a great selection of boat trips and tasty local food including the freshest fish and seafood. As one of the country’s most popular holiday destinations, there’s no shortage of accommodation to suit all tastes and budgets, including a growing choice of award winning hotels, bed and breakfasts and quality self catering establishments. Browse our website to book your accommodation online and discover all that there is to see and do on the English Riviera, Devon’s Beautiful Bay. The English Riviera offers a packed diary of events, meaning whatever time of year you choose to visit, there will be something on to keep you entertained. Torquay, Paignton and Babbacombe have theatres with everything from West End performances and well known acts, to traditional Christmas panto! There are many attractions, things to do and events that centre around Agatha Christie, notably Torquay's most famous resident, as well as the annual Torbay Air Show, Brixham Pirate Festival and England's Seafood FEAST. Take a look at our What's On guide to see what's happening during your visit, or plan your holiday in Devon around some of our fantastic events and festivals. On what is now known as England's Seafood Coast with many new restaurants and bars having opened in recent years, the English Riviera is a haven of food and drink, and whether you are looking to grab a quick bite, or a Michelin starred restaurant for that special occasion, you will find everything in our little corner of Devon to suit your palate and budget. Our seaside towns are lined with pretty tea rooms, cafes, traditional fish & chips and seafood restaurants; our towns are home to well known brands serving food from all corners of the globe, and drive out into the Devon countryside for traditional English pub grub! Want ideas and inspiration? We hope our website tells you all you need to know about your visit to the English Riviera, from where to stay, play and eat to what other great places there are to explore in the area. However, should you need any further help, don't hesitate to contact us. We look forward to welcoming you.